What is Silk Live Soy Yogurt? 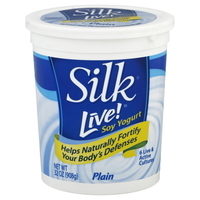 Silk Live Soy is a soy-based yogurt that contains 6 active probiotic strains. 2 of these are in all yogurts: Streptococcus thermophilus and Lactobacillus bulgaricus. Silk Live Soy Yogurt also contains Lactobacillus acidophilus, Lactobacillus bifidum, Lactobacillus casei, and Lactobacillus rhamnosus. Perhaps. yogurt is effective at delivering probiotics only if those probiotics are resistant to stomach acid. The stomach is more acidic on an empty stomach than a full stomach so we recommend eating yogurt with a meal. Lactobacilli are generally stomach-acid resistant because one of the products they make is lactic acid. Streptococcus thermophilus is the only strain that is not acid-resistant. Therefore, Silk Live Soy Yogurt only has 5 viable strains and unfortunately, the number of CFUs is not disclosed. All the ingredients of Silk Live Soy Yogurt are safe and natural. It does not use any artificial sweeteners. 4 stars. We like the number of strains which is higher than most others and the use of all-natural ingredients. Prebiotics Prebiotics are a food source for probiotics. Without a food source, probiotics will not establish themselves in your GI. Yogurt contains simple sugars that probiotics can utilize. Number of Probiotic Strains There are thousands of different kinds of organisms living in your colon. Some are more helpful than others.Some probiotic organisms are more helpful that others.Every probiotic product should have S. boulardii and L. acidophilus. A good probiotic supplement will have more probiotic strainsSilk Live Soy Yogurt has 6 strains, 1 of which will not survive past the stomach. It does not have S. boulardii or L. acidophilus. Number of CFUs (in billions) The number of CFUs is not disclosed. Enteric Coating Digestive juices will destroy many probiotic organisms. An enteric coating or delayed-release system that releases probiotics in the colon helps keep them alive. Unfortunately, Brown Cow Yogurt has no protection mechanism for its probiotics and relies on the fact that some of the probiotics themselves are acid resistant. No artificial coloring, dyes, or sweeteners. Acesulfame increases the risk of artherosclerosis. Brown Cow Yogurt does not have any artificial dyes or coloring. Ingredients: Organic soymilk (filtered water, whole organic soybeans), organic evaporated cane juice, rice starch, dextrose, tricalcium phosphate, natural vanilla flavor, cultured glucose syrup solids, pectin, locust bean gum, ascorbic acid (vitamin C), yogurt cultures (L. bulgaricus, S. thermophilus, L. acidophilus, B. bifidum, L. casei, L. rhamnosus).